GERMANY: Adwen has installed the drivetrain of its 8MW offshore wind turbine on the test bench at the Fraunhofer institute in Bremerhaven. The drivetrain will undergo tests at the dynamic nacelle testing laboratory (Dynalab) until the end of 2016. Adwen said this testing would speed up certification and reduce the time needed for field testing. 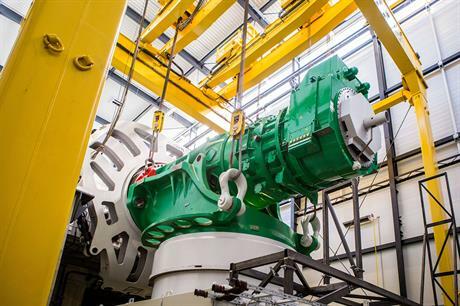 Dynalab, in Bremerhaven, northern Germany, cost €35 million and caters for both geared and direct-drive models. It also incorporates the world's largest and most advanced grid simulator. The main focus of the rig is to provide full system tests, which aim to get as close as possible to real world operating conditions for the machinery. This means that the time spent in prototype field-testing can be substantially reduced, while at the same time minimising the product development risk, and achieving high efficiency and reliability of the product right from launch. Adwen said after initial testing of the drivetrain is complete, the entire nacelle, currently under construction in Bremerhaven, will be moved to Dynalab for further testing before being installed on a prototype machine nearby by the end of 2016.